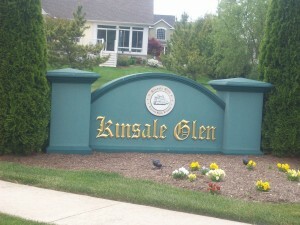 Kinsale Glem home sales Rehoboth are conveniently located in a neighborhood with many attractive amenities. The community’s close proximity to the beach is one of the most notable features of Kinsale Glen. Both Rehobeth Beach and Dewey Beach are convenient to the Kinsale Glen neighborhood, with Rehoboth beach reachable within ten minutes from most Kinsale Glem home sales Rehoboth. In addition to the nearby recreational areas provides at Rehoboth Beach and Dewey Beach, the Kinsale Glen neighborhood is also located near Cape Henlopen State Park, the Rehoboth Beach Country Club, and Lake Gerar Park. Many shopping possibilities are located close to the Kinsale Glen community at the Tanger Outlets found along the Coastal Highway. Typical real estate in the Rehoboth Beach neighborhood of Kinsale Glen consists of single family homes. Kinsale Glen homes come in a variety of sizes, with three or four bedroom homes being the sizes most typical seen in this neighborhood of Rehoboth Beach. Kinsale Glen homes are located amid a beautifully landscaped neighborhood that offers many community amenities that residents can share, including tennis courts, swimming pools, and a community exercise room. Of course, this is an ideal area for those who enjoy being near the beach and taking part in water sports. The Rehoboth Beach boardwalk is another source of amusement that those residing in the area can take advantage of, and Rehoboth Bay and Indian River Bay both offer many opportunities for boating and fishing. The population of Rehoboth Beach tends to increase dramatically during the summer months due to the area’s status as a popular vacation destination for those living in neighboring states. In addition to being able to enjoy Kinsale Glen community amenities, those considering home sales Rehoboth should also take the amenities and attractions of the larger Rehoboth Beach community into account. The area features great schools, with Kinsale Glen being part of the Cape Henlopen School District. Young residents of Kinsale Glen can attend school at a variety of different public and private educational institutions. Public high schools located nearby include Cape Henlopen High School, Sussex Central Senior High School, and Indian River High School. Other educational resources near Kinsale Glen include the Rehoboth Beach Public Library located on Rehoboth Avenue. The universities that are closest to Kinsale Glen and Rehoboth Beach are Salisbury University in Salisbury, Maryland, Delaware State University in Dover, and the University of Maryland Eastern Shore in Princess Anne.